CheeseScience.net: Salting-III. How is cheese salted? Salting-III. How is cheese salted? There are three basic methods by which cheese is salted. The large majority of cheese varieties worldwide are brine salted. This simply means placing the cheese after forming into a concentrated (and often saturated) NaCl solution which diffuses into the cheese. Cheddar and related varieties are dry salted. After acidification, the curd is milled (cut) into small pieces and dry salt is added and mixed with the curd; the salted curd is then pressed. Some Blue cheese varieties can be salted differently by the repeated surface application of dry salt. After forming, dry NaCl is patted onto the surface of the cheese and this process is repeated as necessary to give the desired salt concentration in the cheese. Different methods of salting have very different effects in cheese as will be discussed later. 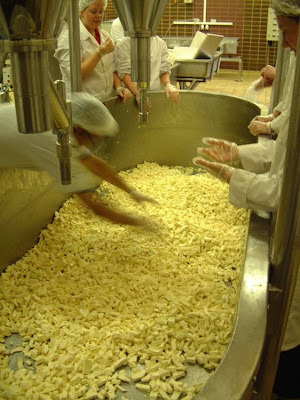 The photo above shows milled Cheddar curd being dry salted by students a few years ago in the UCC Pilot Plant dairy. 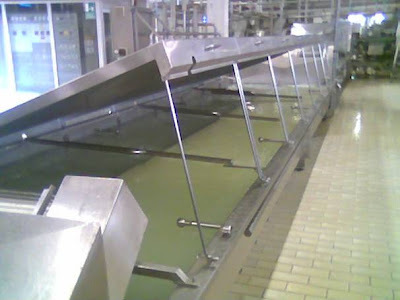 The photo below is of an industrial brine bath taken in a Mozzarella factory in northern Italy.